The Nursery caters for children from 3 months to 5 years. Children develop in enabling and rich learning environments, where each child's learning and development is enhanced by playful activities to encourage resilience, capability, confidence and self-assurance. Bright and airy separate areas for different age groups offer safe, stimulating and happy environments. A high staff/child ratio with qualified and well-motivated practitioners ensures a caring relationship between parents, babies/children and staff. Our practitioners are a dedicated, lovely family; many of them have been at Longwood for over ten years. The team works hard to organise a range of carefully planned, as well as free play, activities to help the children achieve their potential. These involve indoor and outdoor climbing equipment, Montessori equipment, table-top games and puzzles, stories, singing and rhymes, construction equipment, books, interactive computers, home corner and imaginative play areas. All activities are carefully chosen to enhance imaginative, cognitive, physical and language development. Our nursery is very well equipped and children have much opportunity to explore and develop both inside and out. There is a separate cot room in the baby unit, as well as changing facilities and a milk kitchen. Fresh home-cooked and well-balanced meals are prepared on site. We have expansive grounds with grass areas, shady tree areas, soft surface areas, a secret garden, many raised beds for planting and growing, a large 400 square metre all-weather play area with soft roadway, bridge and tunnel, a log world climbing frame, and several canopy areas directly off most groups. Children embrace being outdoors with exploring games, imaginative play houses, climbing equipment, bikes and trikes and gardening. French and Music are taught by peripatetic teachers to the older children. Our practitioners work closely with children and parents to develop a Learning Journal of each child's personal progress. Parents are welcome to share these at any time and are encouraged to contribute to them too. In the nursery, we follow the Early Years Foundation Stage (EYFS) statutory framework. This sets standards for the learning, development and care of children from birth to 5 years old. Nursery is a very important stage as it helps your child get ready for school as well as preparing them for their future learning and successes. From when your child is born, their early years experience should be happy, active, exciting, fun and secure; as well as support their development, care and learning needs. The EYFS supports an integrated approach to early learning and care. It provides a set of common principles and commitments to deliver quality early education and childcare experiences to all children. The 7 areas of learning are divided into 3 prime areas; communication and language, physical development and personal, social and emotional development. These prime areas are those most essential for your child�s healthy development and future learning. As children grow, the prime areas will help them to develop skills in 4 specific areas. These are Literacy, Mathematics, Understanding the world and Expressive arts and design. These 7 areas are used to plan your child�s learning and activities. The professionals teaching and supporting your child will make sure that the activities are suited to your child�s unique needs. This is a little bit like a curriculum in primary and secondary schools, but it's suitable for very young children, and it's designed to be really flexible so that staff can follow your child's unique needs and interests. Children in the EYFS learn by playing and exploring, being active, and through creative and critical thinking which takes place both indoors and outside. At Longwood, we value the views of parents and understand the importance of parents and professionals working together. To that end, we work hard to build excellent working relationships with all parents and carers. � Takes a careful note of your child�s progress, sharing this with parents and giving ideas as to how to help your child at home. Please ask if you require any more information or if you have any questions. You might like to look here. 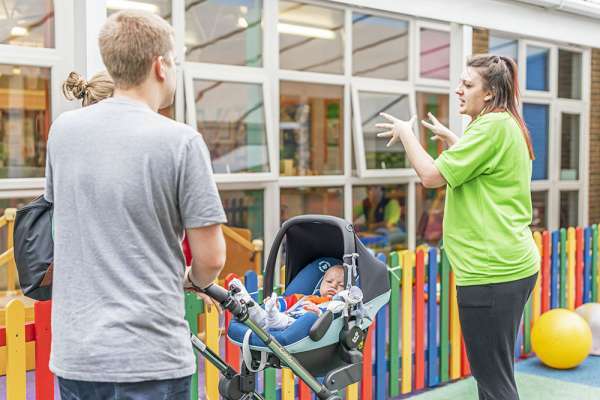 We offer Nursery tours on most days, so please contact us to arrange to come and see us in action. We look forward to welcoming you and your child.